Percy Mitchell. The American Relief Clearing House. 1922. Chapters 4-6. When the munitions of relief had been concentrated at New York or any other American port of the Atlantic seaboard, the difficulties of the A.R.C.H. were only beginning. To get the supplies to their ultimate destination was a complicated and patience-racking operation. Throughout the war, the fate of the Allies hung upon maritime transportation. Only through its agency could they offset Germany's initial superiority in preparation for the world-conflagration she had kindled deliberately. Clear recognition of this lay at the root of her disingenuous cry for "freedom of the seas," ---which meant, so far as it had any meaning, that while she claimed the right to act on land as she saw fit, the Allies were not to utilize legitimately their maritime resources. Those resources, ample though they appeared on paper, were lamentably inadequate. With the major portion of the Allied tonnage assigned to the service of the fighting forces, the whole world had to "tighten its belt. " Like everything else, relief work suffered. The history of the A.R.C.H. distribution operations is largely the history of a struggle against malignant fate, represented by insufficiency of shipping and rolling stock. One melancholy detail in the CLEARING HOUSE records is the constantly recurring allusion to transport shortage and its paralyzing effects. Significant in this respect, and amusing, is a letter (July 1915) in which the New York CLEARING HOUSE, "Warelief," complains that receipt of some particular supplies, sent long before, had not been acknowledged by the A.R.C.H. The letter of complaint was received in Paris two days before the arrival of the overdue supplies! If a shipment were received within three weeks of its departure from the United States, there was satisfaction in the Paris offices of the A.R.C.H. ; when, in September 1915, 2,000 cases arrived within nineteen days, there was jubilation ; and when --- once! --- a shipment arrived in seventeen days it was given the equivalent, in relief work, of a citation in Army Orders ; it was given mention in "the BULLETIN." Even when the material had reached France, the problem of getting it to final destination had yet to be solved. And often, very often, a prompt solution was impossible. The gloom of impending catastrophe hung over this tragedy of transportation ; doubly a tragedy, for it imperilled the vital interests of the Allies and added to the sufferings of untold thousands of individuals. It was an ever-present reminder of the momentous events that were taking place on the field of battle. One's attention is arrested and held spellbound by the inner significance of certain unemotional passages, mere routine entries, in the A.R.C.H. minutes. Take this one: "FEBRUARY 29th, 1916 : Mr. Barbour reported that the transport of shipments would be stopped for some time on account of the military situation. He also reported that all essence for motors had been requisitioned by the Government." For two months the transportation of troops and munitions called for the utmost resources of the railways; absorbed all the country's stock of "essence for motors;" took precedence of even the forwarding of relief for the suffering. A month after the battle opened, Mr. Beatty had to report a heartbreaking situation: between 2,500 and 3,000 cases of clothing and supplies for wounded soldiers immobilized in Bordeaux. M. Ogier, representing the Ministry of the Interior, could only reply, with resignation, that he had intervened several times in an attempt to expedite delivery of relief supplies, and would try again : "But there is Verdun!." Wagons already loaded had been suddenly requisitioned by the War Department, unloaded, and turned into troop trains. In June, at the height of the French offensive, the second battle before Verdun, 3,000 cases were standing on the platform at the Batignolles Station, and 5,000 were sidetracked waiting to be unloaded. And by grim irony, that was the very period when the tide of American aid was rising so rapidly that it became necessary to open negotiations with the French Government for the requisition of additional cargo-space. Additional space! With German submarine pirates steadily reducing the already insufficient tonnage of the Allies --- March, 29 vessels, 144,000 tons sunk ; April, 66 vessels, 163,000 tons ;May, 48 vessels, 99,000 tons June, 52 vessels, 93,000 tons ; July, 43 vessels, 99,000 tons August, 116 vessels, 151,000 tons ; September, 108 vessels, 204,000 tons; October, 166 vessels, 286,000 tons! Additional space! Where was it to be found? The problem only increased in difficulty as time went on. How could it be otherwise, with ships growing fewer and gifts more plentiful? One cablegram from 'Warelief" notifies the CLEARING HOUSE of the departure for Bordeaux of "11844 cases, including 6 trucks (for) American Ambulance, 2 trucks (for) Norton Harjes, 2 chassis (for) Société des Amis, 1 chassis, 1 field-kitchen (for) American Fund for French Wounded." Another, reporting difficulties in procuring transportation, adds : "We have more than 3,000 cases, of which more than one-half is meat, milk, flour; also shoes, shovels, 30 ambulance chassis, hospital supplies, and clothing." And the message ends with the appealing cry : "Can you arrange transport? Hurry." Still another cablegram reads : "310 cases hospital supplies, clothing, en route Bordeaux, leaving more than 4,000 cases in our warehouse." And again the message ends with the leitmotif: "Can you help get space?" In the early months of 1917, when America's entry into the war was seen to be inevitable, the transportation crisis became maddening. A cablegram from "Warelief" runs : "1,250 cubic tons hospital supplies and clothing on hand and rapidly increasing. We must have relief at once." Six days later another despatch emphasizes the difficulties with which the New York committee was beset: "Wire quick if any prospect securing space to relieve our congestion. Warehouse full and supplies arriving in large quantities. PROBABLY NECESSARY STOP SHIPMENTS UNLESS RELIEVED AT ONCE." The next day brought forth another despairing cablegram: "No available shipping in sight. " It was suggested that shipments be sent by way of England. But the cargospace was no greater on that route ; and the additional trans-shipments meant further delay. Nevertheless, the stress was so great that a trial was made ; for the next cablegram reads : "En route, Havre, boat one, 273 cases; en route Bordeaux, boat two, 446 cases; en route London, care Armour and Co. for ARCHOUSE, Paris, 425 cases; en route Bordeaux, boat seven, 274 cases." Another notification of the same period runs : "En route Marseilles, boat four, 214 cases, of which 45, including 1 chassis and body, are for Salonika, and 169 for Paris ; en route Marseilles, boat five, 252 cases destined Salonika ; en route Marseilles, boat six, 502 cases, including 17 destined Salonika and 485, Paris; en route Bordeaux, boat eight, 428 cases; en route St. Nazaire, boat nine, 711 cases, including two autos for Y.M.C.A. ; en route Brest, boat ten, 440 cases; en route Bordeaux, boat eleven, 228 cases; en route Havre, boat twelve, 236 cases." A later despatch conveys the sinister information : "Boats number two and nine sunk." But, that news transmitted, the cablegram continues phlegmatically : "En route Bordeaux, boat nineteen, 317 cases; en route La Pallice, boat twenty, 3,592 cases, including 3 ton trucks for ARCHOUSE, 2 two-ton trucks (for) Norton Harjes, 14 two-ton trucks (for) American Ambulance, and 1,762 cases from Vacation War Relief organization; en route Bordeaux, boat twenty three, 2 cases" --- obviously if there was a foot of space vacant, "Warelief " thrust an odd case into it --- "en route Bordeaux, boat twenty-four, 2 cases autos (for) American Fund French Wounded." American charity had, in fact, thrown a veritable bridge of ships across the Atlantic. But in spite of it the struggle for carriage was incessant. It subsided, temporarily, at one point, only to break out at another. When the situation eased in the field of maritime transportation, it became acute in the field of railway transportation. That is not a matter to cause surprise. Statistics of the work done by the French railways during the war give a glimpse of the difficulties that were created by the mobilization and concentration of the army; by its daily provisionment ; by the movements, never interrupted and on a vast scale, of troops ; by the evacuation of wounded. Every reverse, every success, meant a period of volcanic activity in the railway services. The retreat from Mons necessitated the aid of 120 to 170 trains a day. The transport of reinforcements in the Battle of the Marne called for 170 trains a day. Six thousand trains participated in the battle that immediately followed the Marne and marked the beginning of trench warfare. In 1915, the Northern Company alone ran 114,000 trains in the service of the army --- 78,000 of them for the transport of food and ammunition. Furthermore, there was the work for the Allies. From August 1914 to April 1915, 11,000 trains were allocated to the needs of the British forces in a single district, Rouen. In the early part of 1915, Sikh regiments brought to Marseilles from India in 52 army transports, were carried, with all impedimenta, to the front by the Paris, Lyons and Mediterranean Company. After Caporetto, the despatch to Italy of French and British contingents, and their daily provisionment, monopolized 500 locomotives and 12,000 trucks. To handicap the railways still more, there was a general shortage --- shortage of labour, for the male population was serving the flag ; shortage of coal, for the mines to a large extent were in the enemy's hands ; shortage of rolling stock for the invaders in their first rush had captured 45,000 locomotives and railway trucks. In September 1918, M. Claveille, Minister of Public Works, stated in the Chamber of Deputies that the entire rolling stock then in France, including that belonging to America, Belgium, and Great Britain, was 6%, as regards locomotives, and 9%, as regards wagons, less than the pre-war figures. And in addition, quite irrespective of the purely military exigencies, railway traffic continued to increase. Italy received the coal necessary for her existence from England through France ; Switzerland received food for the population and raw material for her industries through France. Import traffic increased 80% ; export traffic decreased 40%. Hence the impossibility of loading rolling stock returning to seaports. How often, during the war, one heard sarcastic comment on the trains of empty wagons that "everybody," at one moment or another, had seen bowling along to somewhere. The criticism was seldom warranted. The destination of such trains was usually a seaport. Owing to the shrinkage, the virtual disappearance, of the country's export trade, the wagons, if sent there at all, had to be sent empty. And unless they were sent there, the mountains of cargo brought to the sea-gates of France by an endless chain of steamers would remain till the end of the war piled up on wharves and in warehouses. If the rolling stock of the French railways is not yet (1922) up to the standard of perfection, the formidable task it accomplished in the war is sufficient to explain and excuse every deficiency. How the "crises" in transportation affected the work of the A.R.C.H. may be gathered from a reference in the minutes. At a meeting on November 16, 1916 --- the year of tribulation in transport matters --- it was reported, despondently, that there seemed no prospect of radical improvement in the railway problem. "Our shipments latterly have averaged 2,000 cases a week: we have at our disposal only two trucks a day, with a carrying capacity of 100 cases, or 700 cases a week. Thus supplies are accumulating at Bordeaux and our work is greatly hampered. In spite of all the efforts of the War Ministry it has been impossible to augment our clearances." As illustrating the relation between the military operations and the greater or less difficulty of relief work during the war, an example may be given. The Allied offensive on the Somme which followed Germany's defeat at Verdun opened on July 1st 1916. While it lasted, the A.R.C.H. work was crippled. The offensive raged with fluctuating paroxysms of violence until the middle of November, then died away. The lull in the fighting is reflected in a report on November 30, that the outlook was brighter. The transportation authorities had been able to give the A.R.C.H. 5 railway trucks a day: "Very soon the shipments will have been cleared away from Bordeaux." Perhaps that prediction was considered a little too optimistic. Be the reason what it may, the CLEARING HOUSE in December, asked Mr. Barbour to go to Bordeaux and devise a system that, no matter what might be going on in the fighting zone, would obviate undue delay in the delivery of American relief shipments. Mr. Barbour arrived on the 4th ; took all factors into consideration ; tore to pieces the organization then existing and inaugurated one that, by facilitating the handling of shipments and doing away with cartage to outlying points, hastened their despatch to Paris. The new system worked efficiently to the end of the A.R.C.H., largely through the liberal co-operation of Messrs. Natural, Le Coultre and Co., an international shipping agency which placed its entire organization in Bordeaux, free of charge, at the disposal of the CLEARING HOUSE. At the Batignolles Station, Paris. An important factor in transportation troubles was the cartage of shipments from and to the railway stations in Paris. When the CLEARING HOUSE was formed, the Seine Prefecture undertook to effect the transport of A.R.C.H. relief supplies between stations and warehouse. The Prefect little realized what an enormous responsibility he had incurred. The motor-trucks (camions) left in Paris were ludicrously insufficient for the work of the city, and in a very few weeks the resources of the Municipality in this respect were submerged. It soon became apparent that the A.R.C.H. would do well to rely upon itself for the cartage of its relief material. As early as February 12, 1915, when the CLEARING HOUSE was barely two months old, the Chairman of the Transportation Committee reported severe congestion in the consignment services. Material arriving could not be warehoused, material destined for the provinces could not be sent to the stations, owing to the scarcity of cartage facilities. To relieve the situation, the Director-General was empowered to purchase a motor-truck, to be charged to the special relief-expenses account already mentioned. A Peugeot one-ton truck was bought, and formed the nucleus of an important equipment that the A.R.C.H. gradually acquired and added to continually. The New York branch furnished a large Peerless touring car --- a useful gift, but the expense of running was great and finally, with the sanction of the donors, the car was sold. Then, at various periods, one was presented by the Misses Andrews, sisters of Mr. Horace E. Andrews, Chairman of THE WAR RELIEF CLEARING HOUSE Finance Committee ; another --- a Dietrich, which, by the substitution of a box-body, was transformed into a very handy truck --- by Mr. George R. Ostheimer, an active member of the A.R.C.H. General Committee; still another --- a small Willys truck --- by Messrs. Gaston, Williams, and Wigmore. Mr. Clarence Mackay provided the funds for the purchase of a most serviceable 2-ton Pierce-Arrow truck. 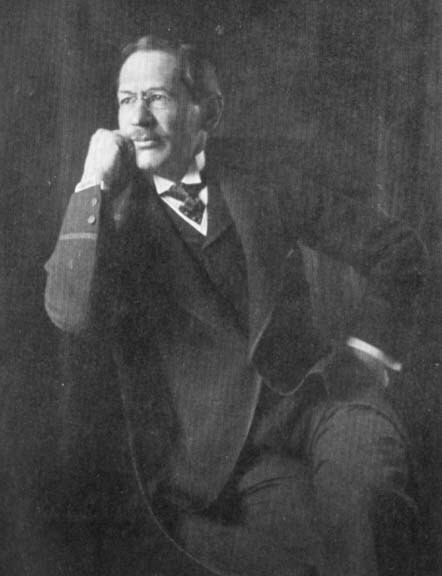 Mr. William K. Vanderbilt, Jun. gave the CLEARING HOUSE a useful Mercedes car. The White Company gave two 2-ton White motor-trucks which the French Government transported from New York free of charge, as a mark of appreciation of the work that was being done by the A.R.C.H. In addition, during the later part of 1915, and throughout 1916, the motor-truck equipment of the American Distribution Service, an organization founded and directed by Mrs. Robert Woods Bliss, did splendid work for the CLEARING HOUSE. 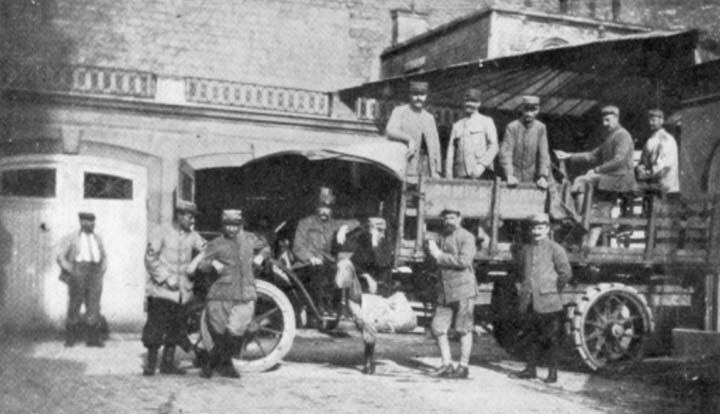 Later, the French Service de Santé, (Army Medical Service) proved invaluable in emergencies by lending one to four motor lorries, and squads of soldiers, to help in the transportation of shipments. In the first month of 1917, the work increased, and continued to increase, so enormously, that negotiations were opened for the acquisition of ten additional trucks. But the negotiations were brought to an end by the entry of the United States into the war and the arrival in Paris of the American Red Cross which took over the work of relief in Europe. At that moment, the A.R.C.H. had a transportation equipment of seven motor-trucks and was handling weekly about 350 tons of relief material. Another truck was in use at Havre so long as shipments were sent there ; but none was needed at Bordeaux as cartage was comprised in the privilege of free transportation on the French railways which the Government accorded to the A.R.C.H. Honorary Comptroller of the A. R. C.H. Its action in granting not only transportation franchise but also Customs franchise shows what an appreciative interest the Government took in the CLEARING HOUSE and what direct support it gave to the work. The question was brought up at a meeting of the A.R.C.H. on December 16, 1914, by Mr. H. Reid Griffin, Chairman of the Transportation Committee ; and the mission of obtaining free transportation and Customs immunity for relief shipments was confided to Mr. Peixotto, Comptroller, and Chairman of the House Committee. He set to work with such vigour, or brought such persuasive eloquence to bear on the Government, that in ten days the matter was settled. The conditions of the dual franchise are contained in two letters.
" (b) From the Paris Committee to any locality situated in French territory.
" It should be clearly understood that such shipments are to be addressed, not to private individuals, but to relief organizations registered at the Prefecture, the Municipality, or the headquarters of recognized associations of public utility.
" Clothes ; foodstuffs; sanitary, pharmaceutical and surgical supplies ; all material for military ambulances and hospitals; tobacco for soldiers; and, in general, all articles intended for the relief organizations of the said CLEARING HOUSE, or for refugees and those in want, whether French or Belgian; or for soldiers of the Allied armies, as indicated in the understanding arrived at with the Finance Minister. I am happy to have been able to co-operate, in the name of the Minister of War, in work of such an eminently philanthropic purpose." The second letter, dated January 14th, 1915, from the Finance Minister, is perhaps a trifle less open-handed, as befits a department that, particularly in wartime, has to ask itself daily: Where is the money to come from?
" You have written me with the object of obtaining right of entry, free of Customs dues, for supplies addressed from abroad to the Committee which has just been created in Paris under the name of THE AMERICAN RELIEF CLEARING HOUSE, to centralize the distribution of subscriptions raised in America for victims of the war.
" (1) Merchandise of which the importation is prohibited (tobacco, cigars, cigarettes, matches, and so on), is excluded from this franchise.
" (3) The shipments in question must be sent direct to THE AMERICAN RELIEF CLEARING HOUSE, or its representatives." The aid rendered is acknowledged officially in two resolutions, one addressed to the Company, the other to its representative in New York, M. Paul Faguet, on the occasion of his retirement in 1916. The resolution regarding the Company states that the Executive Committee of the A.R.C.H. "is desirous of expressing its appreciation of the great assistance that has been rendered by the Compagnie Générale Transatlantique, and of the unfailing courtesy and generous co-operation of its officers and personnel." The Committee, therefore, expresses its "grateful appreciation and sincere thanks" for the "willing service placed at the disposal of THE AMERICAN RELIEF CLEARING HOUSE, and which has contributed so largely to the success of its work." The second resolution states that "M. Paul Faguet has., since the organization of THE AMERICAN RELIEF CLEARING HOUSE in France, extended to that organization and its complementary Committee in New York, a, sympathetic interest and invaluable assistance in the work of transporting to France contributions of relief supplies." The members of the Executive Committee "record their appreciation and gratitude to M. Faguet for the zeal and co-operation that has contributed so materially to the successful pursuit of the work undertaken by THE AMERICAN RELIEF CLEARING HOUSE, and that through his efforts it has been possible to receive many thousands of. cases of supplies carried by the ships of the Compagnie Générale Transatlantique,"
Other organizations helped the work by granting transportation facilities to the A.R.C.H. The Paris, Lyons and Mediterranean Railway Company carried free all relief material for Italy or for Serbia sent by way of Marseilles. The Italian Government accorded A.R.C.H. shipments free transportation on the Italian lines. The Comité des Transports Maritimes brought all its influence to bear to obtain from shipping companies cargo-space free, or at greatly reduced rates, for supplies consigned to the CLEARING HOUSE. The French Western State Railway, in July 1916, gave it a concession of incalculable value. Previous to that date, the A.R.C.H. shipments were delivered in Paris at various railway stations situated a considerable distance from each other and from the centre of the city. Thence, to be checked and their contents verified, they had to be carted to the A.R.C.H. warehouse. Then those cases which were consigned through the CLEARING HOUSE to relief organizations, hospitals, and so on, were carted to such organizations if in Paris, and those for organizations in the provinces were sent back to some station for transportation to the designated address. Result: great delay and much unnecessary work. As already stated, there were, in June 1916, 3,000 cases piled up on platforms, and 5,000 waiting to be unloaded, at the Batignolles, Station. Finally the Ministry of the Interior came to the rescue, and M. André Dejean, Director-General of the Western State Railway, turned over to the A.R.C.H. for its exclusive use, free of charge, one of the biggest roofed and walled-in platforms at the Batignolles Station. The importance of the gift, for gift, virtually, it was, may be gathered from the remark made by M. Ogier, of the Ministry: " Space at railway stations to-day is worth more than land in the Avenue de l'Opéra." From August onwards, the cases arriving in Paris --- sometimes 7,000 to 8,000 a week --- were delivered at the Batignolles Station by Ceinture Railway, the Paris belt line, instead of being delivered at four or five different stations. 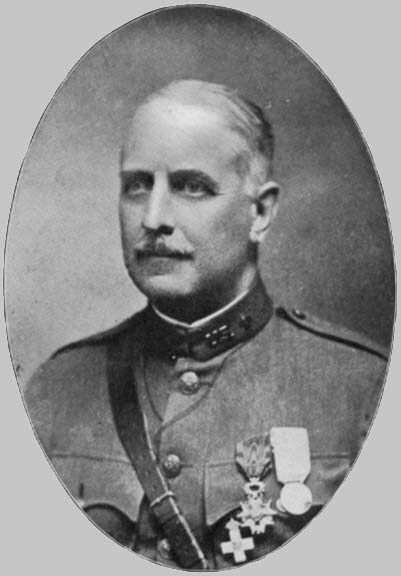 Mr. Barbour, charge of the A.R.C.H. transportation services devised a system that enabled the shipments to be dealt with immediately and quickly. It was extremely simple. The railway ran along both sides of the platform ; so a double service, unloading or loading, was possible. The platform was level with the floor of the railway rolling stock ; so the shipments could be run out direct. Mr. Barbour divided the surface of the platform into sections : cases addressed specially to the A.R.C.H. 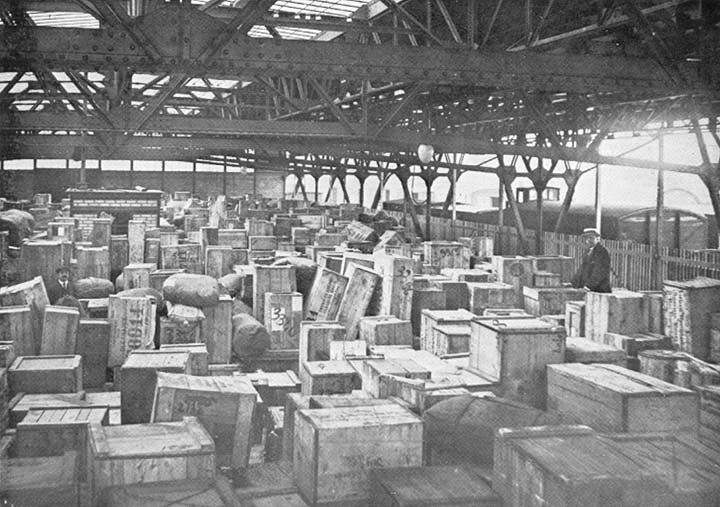 were taken straight from the railway truck to one section ; those consigned through it to some other big organization, such as the American Ambulance, or the American Fund for French Wounded, were deposited in individual sections reserved for them ; in the last section, were placed the cases that had to be readdressed and shipped to designated societies out of Paris. The work in this division was specialized : every case as it was brought in was weighed by a clerk, who noted the weight and other particulars in a register and attached a label. Another employee re-addressed the case in accordance with indications on the label and deposited it in the section allotted to the particular railway serving the designated locality and twice a day, sometimes oftener, camions took away the re-addressed cases to the respective railway stations. Within an hour of arrival at the Batignolles station, shipments were often again on the way to their ultimate destination. The cases for the Paris organizations and the CLEARING HOUSE itself were removed daily in a similar manner. The system ensured accuracy combined with a saving of time and labour, and was maintained in operation by the American Red Cross when it took over relief work in Europe. All the many and formidable transportation difficulties were, in fact, gradually overcome. That they were overcome is, in itself, most conclusive evidence of the energy, adaptability, and resolution that animated the A.R.C.H. workers. A.R.C.H. CAMION READY FOR LOADING BY FRENCH SOLDIERS ON LEAVE. A.R.C.H. CAMION LEAVING THE BATIGNOLLES RAILWAY YARD. Let us pay to the future the debt we owe to the past. "Distribute your country's gifts. Distribute them as rapidly as possible. When there is nothing left, more will be sent us. America's generosity is inexhaustible." The remark, made in July, 1915, by M. Gabriel Hanotaux, embodied a great truth and outlined a fruitful policy. American charity was, indeed, inexhaustible ; and the policy urged, the one followed by the CLEARING HOUSE, the policy of distributing, judiciously but rapidly and without misgivings as to how demands of the morrow were to be met, allowed the inexhaustibility to reveal itself. The distribution service of the A.R.C.H. was not forced by lack of supplies to leave distress unrelieved for long. The cruse never failed. In this branch of the work, the burden of responsibility lay on the Distribution Committee. A daily inventory of supplies in hand was furnished to the Chairman, Rev. 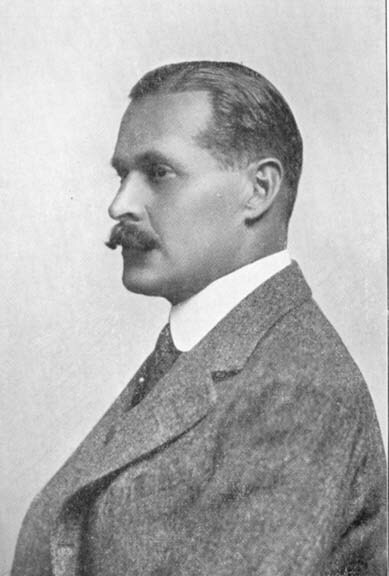 Dr. S. N. Watson; and, at its meetings, the Committee considered all the demands for aid that had been received, turned over to the Investigation Committee those regarding which further special information seemed desirable, and referred the others to the Executive Committee with recommendations dictated by the nature of the demand and the material in stock or expected. 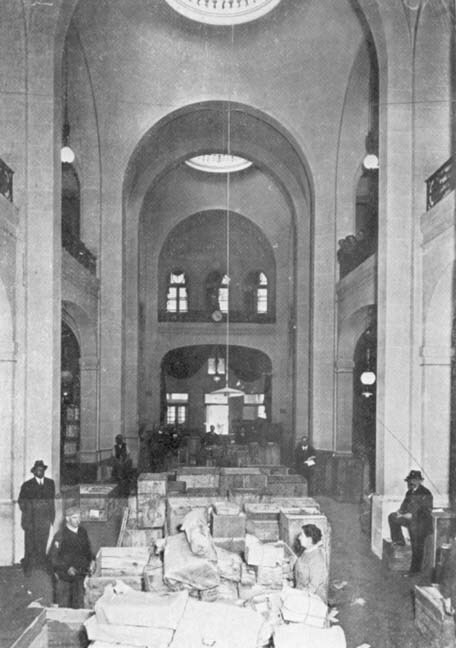 The first consignment of American gifts handled by the A.R.C.H. was one of 49 cases shipped to the American Chamber of Commerce in Paris and turned over to the CLEARING HOUSE for distribution. The cases were sent by the American Girls' Aid Society, one of the first of the American relief societies to begin sending clothing to France. Under the direction of its organizer, Miss Gladys Hollingsworth, daughter of a Vice-President of THE WAR RELIEF CLEARING HOUSE, New York, its shipments were of such practical value that a special vote of thanks was addressed to the Society by the CLEARING HOUSE. Donated for the duration of the War by the Dutchess de Talleyrand. At first the supplies received were stored in the garage of the A.R.C.H. headquarters, 5, Rue François I. It provided accommodation for about 100 cases and bales. But the influx of relief contributions soon made additional storage space necessary. Then it was that the Duchesse de Talleyrand came to the aid of the CLEARING HOUSE, not for the last time. She placed at its disposal, free of charge --- Mine. de Talleyrand defraying the cost of heating, lighting and even of care-taking --- the big building known as the Miller-Gould Foundation, in the Rue Pierre Charron. Here the cases were brought to be unpacked and their contents placed in racks lining the walls of the big hall and commodious cellars. A card-index of every gift, whether in money or kind, recorded the name and address of the giver ; the date of its departure from New York and reception in Paris ; and its final disposition. This was a basic element of the organization. The A.R.C.H. kept ever in view the fact that it was solely a trustee. To be able at any moment to render account for every contribution, big or little, was manifestly a duty owing both to the contributors and the distributors. Hence the importance of this register and the care with which it was kept. In addition, the system served to establish, if not personal relations, at any rate, personal communications between givers and beneficiaries. With every gift transmitted by the A.R.C.H. went a note requesting the receiver to write direct to the contributor, whose name and address in the United States were given, and to acknowledge receipt of the gift. The A.R.C.H. carried even further its efforts to stimulate personal interest in the relief work. It acknowledged by an individual letter the receipt of every contribution ; and, in the letter, gave the contributor some general particulars of the case he or she had aided. No difference was made : those who contributed little were written to as fully as those who contributed much. "Do you take all that trouble for a gift of fifty cents?" asked a visitor, pointing to a letter of thanks which the Secretary was signing. "Why not? " replied Mr. Scott, "the giver took the trouble to send his half dollar --- and his whole heart." To handle and house the supplies on arrival, it was often --- as with their transportation --- not easy to keep pace with the constant increase. When the Miller-Gould hall overflowed, an empty house (17, Rue Pierre Charron) served as a sort of annex warehouse. Later, when still more accommodation became indispensible, the Army authorities provided three big booths in the Boulevard Lannes, with the services of 20 to 25 men to help in the unloading and opening of the cases, and the Paris Municipality lent a covered market in the Rue Maleville. Even then there was not too much space for the operation of opening cases, sorting their contents and preparing parcels for distribution. The daily inventory, a tiny sheet of paper at the beginning, soon developed into an imposing stock catalogue, no sooner compiled than annihilated by the tireless activity of the relief distributors. In its deliberations on the relative merits of the appeals received, the A.R.C.H. was aided by a consultative body, the Comité Central Français de Secours Américains. With this body co-operated other national committees representing Belgium, Italy, Russia, Roumania, Serbia and Montenegro. They formed what was known as "The Allies Committee." Being composed of belligerents, while the United States was neutral, it was an independent organization. Its aim was to help the A.R.C.H. with information and advice on relief work in the countries at war against Germany. To do that, it met in weekly session with members of the A.R.C.H. Executive Committee to discuss conditions of the moment and agree upon plans for coping with possible eventualities. Each of these national groups was under the patronage of its chief of State : President Poincaré, the Tsar Nicholas, the King of Italy, the King of the Belgians, and the Kings of Serbia, Montenegro, and Roumania. The President of the French committee was M. Gabriel Hanotaux, member of the French Academy, one-time Foreign Minister, and a writer whose histories of Richelieu and Jeanne d'Arc are classics; the Vice-President was M. Manuel Baudouin, Premier President of the Court of Cassation, who died in January, 1917. The committee included: the Duchesse de Vendôme ; M. Paul Appell, now (1922) Rector of the University of Paris ; M. Léon Bourgeois, formerly French Premier, and now President of the Senate ; Mgr. Odelin, Vicar-General of Paris ; the Chief Rabbi Lévy, and Pastor J. Pfender; M. Louis Barthou, former French Premier; Vicomte d'Harcourt, Vice-President of the French Red Cross; M. G. Louis Jaray, director of the France-Amérique committee. The Government was represented by. M. Legrand (Foreign Affairs), M. Emile Ogier (Interior), M. Persil (War), and M. Georges Lacaze (Navy). M. Lacaze was killed in an aeroplane accident in 1918 and was succeeded by Captain Durand-Viel. Other officials and administrative representatives were : M. Georges Payelle (Finance), M. Jean Branet (Customs), and M. Souchon (Honorary Secretary of the society to aid mutilated soldiers and seamen). The President of the Russian committee was the Ambassador A. P. Isvolsky, now dead; of the Belgian committee, the Minister of Justice, M. H. Carton de Wiart, with the Minister of the Interior, M. Berryer, as Vice-President ; of the Italian committee, the Ambassador, Marquis Salvago-Raggi ; and of the Roumanian committee, the Minister, M. E. M. Lahovary. Serbia and Montenegro were represented by a single committee of which the late Milenko Vesnitch was President [For complete membership list of the national committees see Appendix 1]. As already stated, the Allies Committee met once a week at the A.R.C.H. headquarters to confer with members of the CLEARING HOUSE executive on the relief needs of France and her Allies. The needs everywhere were overwhelming. To glance through the records of the A.R.C.H. is to realize that Europe was a vast hospital and poor-house. In every part of the continent reigned suffering and want. Surgical supplies, foodstuffs and clothing had no time to gather mildew in the warehouses of the A.R.C.H. The gifts received for "clearance" were rushed off ; the others, as soon as sorted, were swallowed up by the insatiable demands of entire nations. In addition to great contributions in kind, America continued to forward to the CLEARING HOUSE, throughout its existence equally important contributions in money. Much was intended for specific institutions. The remainder was sent to be expended for relief purposes at the discretion of the A.R.C.H. Such funds served to purchase by hundreds of dozens : blankets, sheets, pillow-cases, flannel garments, hospital pyjamas, towels, handkerchiefs, slippers. Material arrived in an ever increasing flood and was bought on an ever increasing scale ; but the demand kept abreast of the supply. The confidence with which those in need turned to America is brought out impressively in the register of requests received and met by the A.R.C.H. They range through the entire gamut of want and wretchedness, from an appeal for a single clinical thermometer, or some safety-pins, to one for food, or clothes, sometimes both, for the famished and destitute population of an extensive district, of an entire province, indeed, as in the case of Serbia, of a whole nation. One day's work of the Distribution Committee in the first week of the Battle of Verdun comprises appropriations of supplies for thirty-five hospitals scattered throughout France. If the A.R.C.H. register of material distributed is a manual of geography, it is also a new Book of Martyrs. Every form of physical suffering, of excruciating torture, is hinted at in those records, forming volumes, of grants of artificial hands, artificial arms, artificial legs, orthopædic shoes, operation tables, hospital stretchers, crutches for the crippled, canes for the lame. Read this ghastly entry among those grants : "Amount sufficient to cover cost of two artificial arms for Sergeant X... of Dr. Carrel's hospital at Compiegne! " Page after page, page after page of "damnable iteration," is filled with long, daily lists, each entry beginning : "amount sufficient to purchase .... .. each being an appropriation from this, that, or another American subscription ; each representing the gift of an artificial hand, or arm, or leg, to Private A, or Sergeant B, or Lieutenant C.
While hospitals and ambulances were cared for with special solicitude, the civilian population was not neglected. Side by side with appropriations for the wounded are appropriations for refugees. After the Verdun battle, 50,000 frs. were placed at the disposal of General, now Marshal, Pétain, for relief in the district. After the German retreat in the Somme, leaving behind them what the enemy called the " zone of death, " 50,000 frs. were furnished to General Nivelle for the relief of women and children in the evacuated territory. Parcels of surgical instruments were often accompanied by games --- the former for the operators, the latter for the operated! Here is an entry that brings tears to the eyes : "2,000 frs. to THE HOME AND CRADLE FOR INFANT VICTIMS OF THE WAR." Here is another: Five cots for BELGIAN INFANT COLONY, Calais," a name and address that spell orphanhood and exile. And still another: "5,000 frs. for THE FRIENDS OF BLIND SOLDIERS." The names alone of the relief organizations aided by America through the agency of the A.R.C.H. would fill a fat volume. Associations to help those ruined by the war --- thousands, scores of thousands, in comfortable circumstances before the cataclysm, found themselves within twenty-four hours penniless and homeless --associations to provide for the blind, or the maimed, or the tuberculous ; to give a fresh start in life to the mutilated by teaching or re-teaching them a trade ; all received attention. An appropriation of 75,000 frs. was voted in April 1917 for the purchase of clothing and blankets to be rushed to devastated northern France. Ouvroirs where women. found employment were encouraged. The articles they made, usually clothes and knitted goods, were purchased and distributed among those in want. This policy was beneficial from a dual standpoint : it created a market for the product of industry, and it diminished unemployment. The policy was adhered to in another form. A big gallery in the A.R.C.H. warehouse was turned into a workroom where women knitted socks, sweaters, mountaincaps, throatwraps, etc., of the wool received among the gifts, and made hospital slippers of carpeting sent by American manufacturers. It is easy to discern, in fact, at the basis of all the A.R.C.H. distribution work, a definite policy, logically conceived and methodically followed. Each category of human misery was made the charge of a member, or several members. The blind, for example, were the special object of solicitude of Mr. J. Ridgeley Carter ; hospitals, of Mr. Walter Abbott; orphans, of Rev. Dr. Watson and Mr. Charles Carroll ; cripples, of Mr. H. Reid Griffin and Mr. Carroll ; "éclopés," of Mr. George Munroe; refugees, of Mr. Randolph Mordecai ; the tuberculous, of Mr. Beatty. Mr. James Hazen Hyde and Mr. Beatty paid particular attention to the work of reconstruction in the devastated area. Merely to deal with demands received did not suffice for the members. They forestalled demands by preparing to deal with situations that seemed likely to develop out of military operations under way or contemplated. Nothing in this respect is more typical than the constant insistence at the A.R.C.H. meetings upon the necessity of being ready to further the revival of agriculture in the region of desolation after the war. It reminds one of the elder Cato's harping on the Carthaginian danger. In the first weeks of 1915, Mr. Hyde and Mr. Peixotto began to ventilate the subject. They obtained, through the generosity of Messrs. Charles and James Deering, a gift of five reaping and binding machines. Through the New York Farmers' Association a gift of priceless value was obtained : 25 ploughs, 25 harrows, 25 reapers, 25 horse rakes, 25 binders, 25 mowers, 5 hay tedders, and fifteen hundred shovels, hay-rakes and forks. Investigation of the results obtained at a farm founded at Juvisy by the Union des Colonies Etrangères, an admirable association of the foreign colonies in Paris formed to aid war victims by Mr. Bernard Shoninger, a former President of the American Chamber of Commerce, led to a grant of frs- 400,000 to the Union. Constantly the question of French farming interests in the future came up ; and always the aim of the discussion was to outline an efficacious policy of action for the A.R.C.H. Obviously, no individual gifts could suffice to re-create the agricultural equipment, the accumulation of centuries, that vandalism had destroyed. Mr. Beatty suggested the idea of "honour loans" to farmers, under State guaranty, for the purchase of implements and the resuscitation of the agricultural asset of France. When the enemy had been driven from Noyon and the vicinity in April, 1917, the first shipment to the district taken by the A.R.C.H. camions included farming implements and a supply of live-stock, 2,000 fowls and 800 rabbits. And it is characteristic, of the far-sighted methods and policies of the CLEARING HOUSE that Mr. Beatty placed the live-stock under the protection of the Mayors of the different communes : it was given not as food, but as the starting-point of a systematic effort to restock the region, which the Germans, in their brutal phrase, had "sterilized." A sum of 100,000 frs. was set aside for the purchase of other barnyard live-stock for the liberated district. In all its main divisions, the work of relief was studied with the same thoroughness, not only in detail but as a whole. What steps should be taken to make the blind capable of self-support? America was anxious to aid them. Would not the best aid be that which would restore them to a place among the active forces of the nation? That, in outline, is the question which the A.R.C.H. carefully studied in considering how to relieve the blind. It looked, as always, beyond the needs of the moment. Therefore, it gave cordial support to the "Phare de France," an association working in co-operation with an American society, "The Lighthouse." Its aim was to teach a trade to men blinded in the war, so that though deprived of sight life might not be for them devoid of light. It was under the patronage of President Poincaré, of the American Ambassador, the Hon. W. G. Sharp, and of the French Ministers of War, the Navy, the Interior, and Public Instruction. The President of the "Phare" was Miss Winifred Holt, a foundress of the American "Lighthouse;" the Vice-President, Mrs. Cooper Hewitt, and the Honorary Secretary, Mr. J. Ridgeley Carter, the two latter, active members of the A.R.C.H. But the encouragement of a single organization was not enough. For its guidance in the intelligent and methodical relief of the blind, the CLEARING HOUSE went, as was its custom, to the root of the matter. What was the situation ; the best remedy ; the cost? M. Baudouin analyzed the available statistics and drew up a remarkable report on the trades and professions open to the blind, the method and duration of training, the number of institutions already existing, the number needed, and the estimated cost. M. Noblemaire, President of the Valentin Haüy Association, an institution for the education of the blind founded by M. de la Sizeranne, who lost his sight in childhood, outlined to the Committee the results obtained. Mr. Walter Abbott and Mr. Charles R. Scott visited the institute to study its organization and discuss with M. Noblemaire ways and means of extending the work to meet the greater requirements due to the war. M. René Vallery-Radot, President of a society already referred to, "The Friends of Blind Soldiers, " summarized the methods that experience bad shown to be necessary in leading the blind gradually from the condition of blank despair that always follows the first realization of sightlessness, to the state of courageous resignation, and even cheerfulness, that supervenes when they have "learned to be blind, " when they have discovered that they are not wholly cut off from the living. The searching enquiry enabled the A.R.C.H. to work judiciously and efficaciously for them. In every other field, it prepared itself with corresponding conscientiousness to act as an efficient, that is, faithful, trustee. To decide upon a policy concerning tuberculous soldiers and those who, released from the army as inapt through illness not contracted while in active service, are not entitled to a pension, the A.R.C.H. had the benefit of M. Millerand's sources of information. With regard to the maimed, it was enlightened by M. Louis Barthou, President of the society to help the amputated by teaching them a trade, and by providing them with artificial limbs. This latter point was exhaustively discussed at more than a dozen meetings ; methods of manufacture, relative merits of French and American work, output capacity, and cost, being completely threshed out. The vast movement in the United States to aid French war orphans provided another occasion for the A.R.C.H. to render services of inestimable value to benefactors and beneficiaries alike by keeping them in touch with each other. A fraternal spirit marked the relations of the CLEARING HOUSE with other bodies, French and foreign. There are, in its records, countless passages indicative of this. Once the "Phare de France" was in a quandary owing to the non-arrival of a motor-car shipped from America. Immediately, one of the A.R.C.H. cars was placed at its service. Another organization lacked storage space at a certain moment. At once, a floor at the A.R.C.H. was at its disposal. As for the French, all regarded the CLEARING HOUSE with confidence and gratitude. The Director of a State service, the Entrepôt des Dons, asked it to supervise the distribution of relief material in a part of the Somme evacuated by the enemy. When the army Medical Service organized a co-operative section to supply hospitals with foodstuffs, the new organization at once appealed for the assistance of the A.R.C.H. supremely confident of its ability to help and of its willingness to help. The same confidence animated the entire French Government. At one moment, the France-Amérique committee believed itself called upon to take over the transportation by sea of American gifts, and it obtained official promises of the precious cargo-space necessary. There was more zeal than judgment in the project. Two centres are one too many for a single circle. With the A.R.C.H. already "centralizing " American contributions, and the France-Amérique committee working to "centralize" them, the shipments were threatened with too much centralization. The one body or the other was superfluous. More : the duplication would be hurtful. Two bodies vying in the shipment of relief supplies would have meant a return to the conditions of dispersed effort to remove which the CLEARING HOUSE had been created. It had proved both its necessity and efficiency. It could not accept, it could not be expected to accept, a situation which, by making it dependent upon, therefore, subordinate to, a totally inexperienced competitor, would lower its prestige and diminish its usefulness. Placed squarely before the, facts, the French authorities did not hesitate. They threw the whole weight of their support on the side of the A.R.C.H. And the rival project, stillborn, was abandoned by its begetters. Not only was the CLEARING HOUSE specially recognized by the French Government as the sole official organization for the distribution of American aid ; it was also asked to exercise a sort of supervisory function as regards persons going to the United States with the object of collecting funds for war charities. No higher compliment is possible. Effective supervision was, of course, impracticable. Nothing could prevent anyone from addressing gatherings of Americans in behalf of a charitable association. Nor could such gatherings be prevented from contributing in response to any appeal. The idea underlying the suggestion --- never put into practical effect --- was that those collecting funds for charitable organizations ought to be above suspicion. And in the eyes of the French authorities nothing could better raise them above suspicion than the moral endorsement of the A.R.C.H. There was an invigorating American contempt for red-tape in its system of working. The question once arose, for example, whether demands for relief should be dealt with on the basis of priority or urgency. Undoubtedly, the continental bureaucrat, the routine-bound official, would have clung to the former principle as to a rock of salvation. And there is, it must be confessed, a semblance of logic and justice in the rule : "first come, first served." But it is only a semblance ; at any rate in relief work. The war incessantly created situations of appalling distress that caused preceding cases, also appalling, to seem in comparison almost benign. The A.R.C.H., throwing bureaucratic principles to the winds, and adhering only to common sense, laid down the rule that in the distribution of aid, precedence should be given to the applicant most urgently needing relief, not to order of inscription in the register of demands received. Its perpetually alert spirit was also intensely American. It was always on the look-out for opportunities to help. An organization, the Anglo-American Relief for War Victims, founded by Miss Grace Zorbaugh, after working indefatigably and successfully to succour the Somme refugees, numbering between 40,000 and 50,000, was reported to need financial assistance. At once, Mr. Mordecai went to Amiens, looked into the situation, found the need so real and the organization so capable and worthy, that continuance of the work was desirable in every respect. As a consequence of his detailed report, the Association was strengthened and the campaign in behalf of the Somme refugees was intensified in the United States. This alert spirit showed itself in unrelaxing effort to utilize to the fullest extent the supplies available. One summer, the A.R.C.H. had in hand a considerable store of sugar. About the same time, the newspapers reported an abundance of fruit in the Oise district. The A.R.C.H. promptly established a connection between the two facts. It used the sugar to make the fruit into jam of which there was never too much for the hospitals. There was, indeed, never too much of any kind of relief material. "Distribute the gifts; distribute as rapidly as possible ! " M. Hanotaux had urged. And the A.R.C.H. distributed rapidly, lavishly. But the war created needs ever more swiftly than charity could relieve. The growth in both respects is strikingly evidenced in the records of the A.R.C.H. meetings. Early in the war, the daily list of aid grants voted do not fill a page. In 1916-17, they fill four, five, six pages. At one meeting, February 13th, 1917, they amount in value to 54,085 frs. At another, April 17th, they amount to 129,306 frs. At still another, June 8th, to 480,812 frs.! And as a little indication that the keen American vision, sweeping over the wilderness of human wretchedness, missed no signal of distress, howsoever timid, here is one of the grants, one that should make the name of THE, AMERICAN RELIEF CLEARING HOUSE precious for all time to the brotherhood of the pen and to every lover of Letters : "Five hundred francs; to THE MUTUAL AID SOCIETY OF POETS." I have devoted my income and labour to others. What was the cash value of the aid furnished? That is a question easy to answer partially, impossible to answer completely. The value of the material aid given is known; that of the personal element in the undertaking cannot be calculated, in terms of money. Both factors, call for some consideration. Let us begin with the former. In its lifetime, the A.R.C.H. published four balance-sheets. They contain all the essential particulars of its work. As already remarked. the CLEARING HOUSE records were kept with scrupulous care. To do so was a moral obligation incurred towards those who provided the money and material distributed. It was also a necessary measure of self-protection. Under the stress of a great crisis or strong emotion, mankind will give lavishly of its wealth. But the crisis ended, the emotion subsided, it is apt to ask: "What became of all we gave?" And in the question there is often more suspicion than curiosity. It was a clear recognition of this universal foible that caused the A.R.C.H. to record every detail of its work with care. The accounts were audited gratuitously by a well-known firm of chartered accountants in London, Messrs. Doloitte, Plender, Griffiths and Co. A "card-index " registered the "history" of every gift --- the date on which it was given and forwarded to the CLEARING HOUSE the date it was due to arrive ; the date it was disposed of, and how; the name and address of both giver and receiver. A system of inter-locking checks enabled the executive of the A.R.C.H. to safeguard the contributions of which it was the trustee. Each week a detailed list was sent to THE WAR RELIEF CLEARING HOUSE in New York recording the disposition made of every gift ; and in case any of which the shipment had been announced had failed to arrive, the list called attention to the non-arrival. Such incidents happened. Losses of material in transit were inevitable in a time when submarines were sinking, monthly, thousands of tons of shipping, and when cargo waited in warehouses or on wharves, sometimes for weeks, before space for it could be found on a vessel or train. But the loss was amazingly small. It averages, for the entire existence of the A.R.C.H., one case per 1,000. The average in time of peace is probably no lower. There is, consequently, no difficulty in the question What was the intrinsic value of the aid distributed? At the end of this volume is reproduced in full the final balance-sheet of the A.R.C.H. It summarizes all the transactions of the organization, from its inception, November 26, 1914, to the date on which the books were definitively closed, December 16, 1918. The document is so simple and clear that the veriest tyro in book-keeping will find it easy to understand. A little comment may help to bring out the significance of some of its features. All contributions in money were classed under one of two heads : General Relief, and Special Relief. To the credit of General Relief were placed all funds of which the distribution was left by the givers entirely to the judgment of the CLEARING HOUSE Committee. 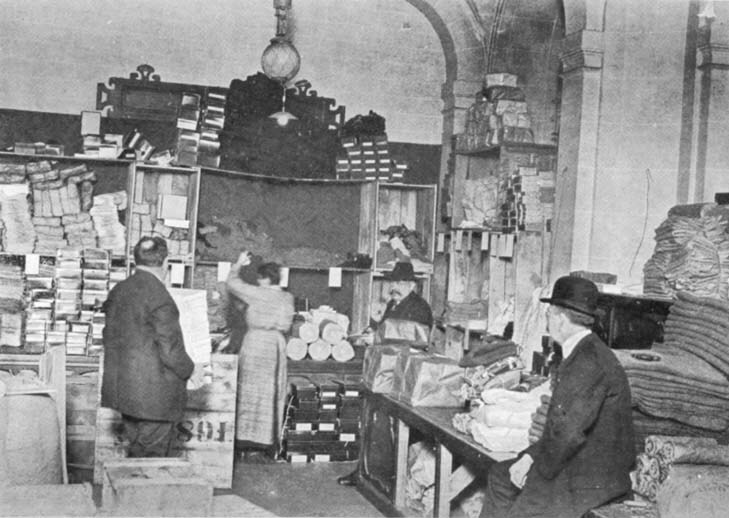 Such funds permitted the distribution services to supplement gifts in kind received from America with purchases of articles not among the material in hand and more quickly and cheaply obtainable in Paris. The General Relief Fund also served to provide hospitals with articles such as wheel-chairs, lounge-chairs, writing materials, books and games with which to while away the tedious days of convalescence, or tools to be used in the teaching of trades to amputated soldiers ; articles, in short, not usually supplied by the Government as they are outside the category of "hospital material" in the strict acceptation of that term. The General Relief account was also drawn upon for grants to welfare organizations, and to valuable institutions, such as the soldiers "Foyers," where men on leave could meet to read, write, and enjoy innocent recreation amid surroundings that bore the semblance of a home. The total sum contributed under the heading : General Relief, amounted to : 790,260 frs. 82 C.
To the credit of Special Relief were placed all contributions for designated associations, persons, or purposes. They were, of course, disposed of strictly in accordance with the instructions of the donors. This account comprised every gift in money received for relief work in specified localities or countries, or for the purchase of particular articles. The A.R.C.H. books contain an impressively long list of accounts for definite objects. There are special accounts, or Funds," for : "Relief in Albania," "Relief in Armenia," "Relief in Italy," "Relief in Russian Poland," "Relief in Russia," "Relief in Serbia," "Relief in Montenegro." There are accounts for "French Refugees," for "Blind Soldiers in France," for "Fatherless Children in France," for "Non-Combatants in the North of France," for "Refugees of the Somme," "Needy and Destitute French Boys," "French Women and Children," "War Cripples," "Repatriated Civilians," and "Children of Devastated Northern France." There are special accounts for the purchase of a host of articles. For example: there is a "Tobacco Fund," a "Sheet Fund," a "Woollen Purchases Fund," a "Shirts and Underclothing Fund;" there is a fund for "Warm Clothing and Hospital Garments," another for "Winter Clothing;" there is a fund for aid in "Maternity," and one for the provision of "Maternity Kits." There is a fund to provide assistance --- that is wool for knitting and woven fabrics for clothing --to "ouvroirs," and one to provide work for the wounded, the "Blessés au Travail." There are accounts for Belgium --- "Belgian Relief," "Belgian Refugees in France," "Belgians in the North of France:; for Serbians---"Relief in Serbia," "Hospital Supplies for Serbia," "Serbian Non-Combatants," "Serbian Refugees," "Serbian Rescue;" for Montenegro -- "General Relief in Montenegro," "Montenegrin Refugees in France;" for "Polish Non-Combatants, " --- the frequent recurrence of the mention "for noncombatants" accompanying gifts shows how tenaciously the sympathizers with suffering clung to the principle of neutrality. There are accounts for "Polish Relief;" for "Russian Refugees," for "Relief for Galician Refugees." There are accounts to provide aid for "Les Mutilés de la Guerre," for "Consumptives in France," for "Distressed Gentlefolks," --- not the least pathetic category of war victims. There is a "Milk" account, a "Reconstruction" account, an account for the "Re-education of Cripples and Maimed." There are accounts to provide " Hospital and Medical Supplies," and "Hospital Clothing." There is an account devoted to the purchase of "Anæsthetics," and even one for the purchase of "Wooden Shoes for France." It was sorely needed. In an appeal dated November 30th, 1915, M. Guérin, President of the Committee of Supplies for the Invaded Provinces of Northern France, makes a remark which throws a cruel light on the destitution of the inhabitants. "Even sabots," he writes, "are no longer available WOOD BEING UNOBTAINABLE ". The amount contributed for Special Relief was 5,401,268 frs. 69 c.
The item : "5,127,163 frs. 91 c. Amounts cleared to other relief Societies and Individuals, is the sum of the funds forwarded to the A.R.C.H. for transmission, or "clearance," to various associations or their representatives ; as, for example: The American Ambulance, Paris; The American Fund For French Wounded, Paris ; the Comité de Secours National, a French organization under Governmental patronage, created on August 6th, 1914, to succour the families of mobilized men; the French Red Cross; the Franco-Belgian and American Hostels for Refugees; special hospitals and ambulances; the French Widows and Orphans Fund; a number of "ouvroirs" and relief associations, such as, "Le Bon Gîte," to provide shelter and a little comfort to the homeless; "L'Appui Belge," to help Belgian soldiers at the front ; "La Goutte de Café," to furnish a cup of hot coffee to soldiers arriving at railway stations from the front or on their way to it ; and a large number of organizations to assist orphans, the mutilated, and "éclopés," a name given to soldiers sent to the rear to recuperate from the effects of minor wounds, sickness, shell-shock, shattered nerves or deafness caused by prolonged artillery fire. Clearance work formed an important part of the services rendered by the A.R.C.H. to those desirous of helping France. In its first year of existence, it cleared 1,329,033 frs. 87 C. for various organizations and individuals in its second year : 2,446,510 frs. 89. As already pointed out, nothing was deducted for administration from relief contributions. They were distributed integrally, all operation cost being paid by supporters of the CLEARING HOUSE. The sums given for such purpose were credited, in conformity with the expressed preferences of the respective donors, to special accounts for "Maintenance," "Automobile and Camion Purchase and Upkeep," and "Publicity." The main contributors to these funds were : THE WAR RELIEF CLEARING HOUSE, New York, which made a weekly donation of $ 400 ; and the American Red Cross which also made a regular grant towards the working expense of its agency representative, in France. The A.R.C.H. was appointed to that onerous post on December 18th 1914, by General George W. Davis, Chairman of the American Red Cross General Committee, Washington. In its official bulletins, the Red Cross referred repeatedly and in highly complimentary terms to the able manner in which its work in France was carried out by the A.R.C.H. And at a meeting on June 9th 1916, of the CLEARING HOUSE Executive Committee, the Honorary Secretary read a letter from Mr. Ernest P. Bicknell voicing the satisfaction of the American Red Cross with the CLEARING HOUSE, its official representative in France. The services of the Red Cross were not confined to the payment of a monthly contribution. It also forwarded considerable quantities of surgical and medical supplies, clothes, and other kinds of material aid. One of the earlier gifts distributed by the A.R.C.H. consisted of 36 cases of clothing from the Red Cross, shipped on the Chicago with a big consignment to the Comité de Secours National. And to the day the CLEARING. HOUSE was taken over, the American RED CROSS continued to furnish hospital material of the best quality which was distributed in its name by the A.R.C.H. Other contributors to the maintenance and operating expense were: The Refugees Relief Fund (for motor-truck service) ; The National Allied Relief Committee, New York; The War Relief Bazaar Fund, New York; The American Fund for French Wounded (motor-truck service). To complete the list of contributors, there were the members of the CLEARING HOUSE. The majority gave personal service, or help in some shape or form --- Mr. Irving G. Will, for example, lent, free of charge, the desks and all other office furniture used by the A.R.C.H. throughout its existence --- and all the members, gave a cash subscription --- ranging from 500 frs. minimum, to 5,0000 frs. --- towards paying the incidental expense of administration. It was, in fact, through a supplementary movement of liberality that the A.R.C.H., having received 86,690,152 frs. 23 c. for relief, was enabled to distribute integrally 86,690,152 frs. 23 c.
But that sum is merely a drop in the ocean of America's largess. The entry of the United States into the war marked the beginning of an epoch of open-handed support of organizations consecrated to the well being of the fighting forces and to the work of helping war-victims. The American Red Cross, the Young Men's Christian Association, the Knights of Columbus, and a host of smaller bodies were provided on a gigantic scale with funds. The Red Cross alone, in one week, received more than 150 million dollars in subscriptions. And all these associations were assured of maintenance during the war. In the world-crisis, America showed that besides consummate physical and moral courage, she possessed a courage that is far more rare, the courage to be prodigal in well-doing. The eighty-six millions were, in short, merely the sum of that aid which America transmitted through the A.R.C.H. to France and her Allies. They are over and above the aid contributed direct to thousands of organizations, created and labouring to "win the war." And the balance-sheets of those organizations are silent regarding the service given by a host of volunteers in hospitals, ambulances, and societies for the alleviation of misery. Who can compute in terms of coin the value of that service ? Unless it be taken into account no adequate conception of the world's charitable effort can be formed. It is an element of fundamental importance in the work. Money is, we are told, the "sinews of war. The saying is less true than is commonly believed. "Scientific" warfare may be difficult to wage, may be impossible, without the financier's help: but men can, and probably always will, make war so long as they may possess muscles, and fists, and passions. Admitting, however, that money is partly the sinews of war, it is to an even greater degree the sinews of charity. Money, however, money alone, does not suffice. Something more than the material sinews of relief is necessary. Sinews, real or figurative, without will to set them in motion, and intelligence to guide their action are merely inert matter. Money, the sinews of relief, is powerless to relieve until vitalized by human will, abnegation and sympathy. The material which figures on the balance-sheets of the ARC.H. was a part, but a part only, of the sinews of relief. The other part. the better part, was the "great and manifold" service of men, and women in the cause of brotherhood. Take, as a case in point, the A.R.C.H. It existed solely through altruism and personal effort. Not otherwise. It was the work of its members, work performed day after day, through the long months of the war, that gave vitality to what, without that work, was dross. Their unremitting toil was an element of the "sinews of relief" as precious as the material provided by the toil and ardent generosity of other Americans. All worked for all. The spirit, of altruism was not confined to the volunteers. The salaried staff also was imbued with it. This was illustrated on New Year's, Day, 1916, when THE CLEARING HOUSE gave its employees the customary bonus for loyal service during the year. Several promptly paid it into the General Relief Fund as their free-will offering. "The heart gives neither that which silver nor gold can buy. " As for the volunteers, their devotion to the work is seen in the steady growth and success of the undertaking. The first reflection inspired by the records of the daily committee meetings, is that absenteeism was almost unknown. The members cannot have attended to their own affairs with greater assiduity than they displayed in attending to the affairs of charity, that is, of the A.R.C.H. But meetings formed, as the preceding pages must have made plain, only a very small part of their daily labours to further the common cause. The reception and forwarding of material involved a vast amount of routine work. Every opportunity was seized by the individual members to carry out missions of relief in the "zone of devastation." 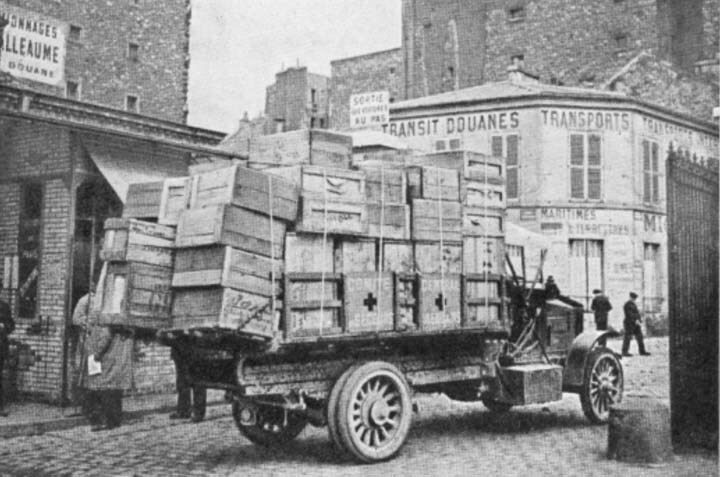 During the battle before Verdun, for example, and after the German retreat in the Somme, and the liberation of Noyon, camions loaded with food and clothing for the population were rushed to the centres of distress where the materials were distributed by Mr. Beatty, Mr. Bertram Winthrop, Mr. Leroy King and the late Charles Carroll. The latter was an indefatigable worker. He was ever in the breach. If an arduous task was to be done he was always among the first to volunteer for service. With Mr. Hugh Reid Griffin, Mr. Charles Butler and Dr. Edward M. Ryan, Mr. Carroll undertook an important and difficult mission of Serbian rescue which will be dealt with in a later chapter. With Rev. Dr. Watson, he made a most comprehensive investigation of welfare work for "war orphans," and the joint report which was the outcome of it, a monument of conscientious research, was of immense value to the CLEARING HOUSE. Another equally luminous and serviceable report was made by Mr. Carroll on the measures advisable for the efficacious assistance of maimed soldiers. He was, in fact, one of the main sources of strength for the A.R.C.H. Hon. Secretary of the A.R.C.H. The work of the members in all the fields of its activity was beyond praise. When not occupied in stimulating production of "the sinews of relief" they were strenuously working to bring about the best employment of them. Hospitals and ambulances in different sections of the country were methodically inspected, and valuable reports analyzing their needs were furnished by Mr. James H. Hyde, Mr. Hoff, Mr. Walter Gay, Mr. Mordecai. Mr. Whitney Warren, Mr. Charlie Knight, Mr. W. H. Conklin, Mr. William S. Patten --- to whom a special resolution of thanks was voted --- repeatedly made journeys to the seat of relief operations to gather information for the guidance of the A.R.C.H. distribution services. A book of singular value to specialists could be made of the members' reports, the outcome of patient research and personal investigation, on orphans in France, on the blind and maimed, on reconstruction work, and other problems of the war. The task undertaken and accomplished was enormous. The President, Mr. Harjes, found ample employment for his time, and knowledge and tact in the work of unravelling governmental and administrative complications created by wartime conditions. The Director-General, Mr. Beatty, had to be, and was, like a strike committee, " n permanent session," always on duty, encouraging, supervising, suggesting, facilitating matters, and adroitly imposing the system of doing "right now" where too often the system in usage was "never do to-day what you can put off till tomorrow." He proved that he possessed to an exceptional and very rare degree the gifts that make leaders of men --- the ability to gauge what is possible, clearness of views and expression, resolution in the carrying out of a decision taken, enthusiasm and the power of inculcating enthusiasm. He was exacting, but asked of none an effort greater than the one he made daily and cheerfully. The French Government showed its appreciation of Mr. Beatty's services to the cause of humanity by conferring on him first the ribbon of Knight, then the rosette of Officer, in the Legion of Honour; and the CLEARING HOUSE Committee, on the motion of Mr. Whitney Warren, seconded by Mr. Charles Carroll of Carrollton, passed unanimously a resolution to record on the Minutes "its appreciation of the labours and efforts of the Director-General in the work of ARCHOUSE and to assure him of its full confidence." 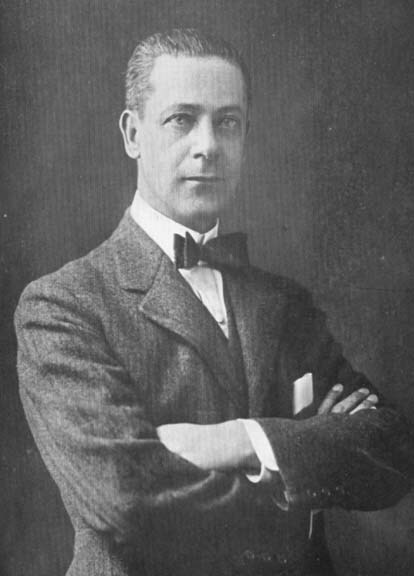 The Honorary Secretary, of the Executive Committee, Mr. Charles R. Scott, coped with duties that for extent, variety and difficulty left little to be desired. They comprised, of course, attendance at Committee meetings, the drawing up of minutes, and preparation of the "agenda." They included a mass of correspondence with givers. and receivers of relief and with "WARELIEF." They embraced, at one time, the book-keeping. The Secretary received visitors, interviewed officials, smoothed ruffled susceptibilities, and the rest of the time lent a hand with any work that might be in need of help. Mr. Scott cheerfully performed those and many other duties during more than two years. A British subject, past military age, he finally succeeded by dint of persistent applications in being taken for the Army, and was attached to the Ordnance department. There, possibly, he never had to work more than twelve or fourteen hours a day. After the A.R.C.H. it must have seemed a holiday. On his resignation, a special resolution was voted by the Executive Committee, the President, Mr. H. H. Harjes, voicing the regret felt by the CLEARING HOUSE members and the "deepest and warmest appreciation of the immense services of Mr. Scott since the creation of the A.R.C.H. ;" the Director-General, Mr. Beatty, adding that there was no adequate way of expressing the general feeling of regret ; "the Administration Committee," he observed, "had worked closely with Mr. Scott for over two years; their relations had been most pleasant, and the parting was a great blow." Mr. Randolph Mordecai, who for two years had been the Assistant Secretary, succeeded Mr. Scott as Honorary Secretary and inherited all his work and worries. He had joined the CLEARING HOUSE in the first weeks of its existence in circumstances characteristic of the self-denying spirit that animated all the members. He had been dangerously ill with sciatica and was still suffering when the CLEARING HOUSE was created ; but he promptly volunteered to help the new organization. The day he called at the Embassy rain was pouring down pitilessly, icily; it was just the kind of weather sciatica loves, and certain sharp twinges may have caused Mr. Mordecai to wince; for Mr. Scott asked not very hopefully: "What can you do?" "Anything," was the cheerful reply "anything --- except stand outside in the mud." It was no idle boast. Mr. Mordecai's share in the administrative work of the CLEARING HOUSE can scarcely be over-estimated ; all the time it left free was taken up with a campaign in the American press, a campaign that produced notable results in the form of cash contributions and gifts of material for France. Honorary Secretary : Executive Committee. Another energetic worker was Rev. Dr. S. Newell Watson, Chairman of the Distribution Committee. By his assiduity at the meetings, his eloquent appeals in the pulpit and on the lecture platform, and his personal efforts in behalf of the blind, the maimed and, particularly, the "war orphans," he contributed enormously to the development of the CLEARING HOUSE. On February 8, 1917, in transmitting to him the cross of the Legion of Honour, M. Hanotaux, in behalf of the French Government gratefully acknowledged the exceptional services that Dr. Watson had rendered to the French nation by his "generous activity, tireless labour, conscientiousness and tact." "Every time we have had a delicate mission to carry out," M. Hanotaux continued, "we have always turned to you to act as our ambassador; and your perspicacity and the confidence your personality and your sacred office inspire have invariably crowned your efforts with success." These are typical examples of the A.R.C.H. spirit. It animated all the members. The late Walter Abbott, and the late Ralph Preston were among those always in the breach. The former, as Secretary of the Distribution Committee, grappled with an ever growing task, the preparation for the Committee's deliberations of a detailed analysis of the circumstances underlying every request for aid, whether from an individual or an institution, indicating the status of the applicant and all the particulars that could enable the Committee to avoid "over-lapping," that is, duplication, and error in the apportionment of relief. The labour involved was tremendous. To form even a faint idea of its magnitude one must turn over the pages of the big registers in which are recorded the thousands of "grants" of relief made by the CLEARING HOUSE. Every one of those cases necessitated long, conscientious preliminary study, often hours of investigation, by Mr. Abbott. Only tireless application and entire self-sacrifice could have carried him through the task. The terrific drain on strength and vitality told in the end, and certainly hastened Mr. Abbott's death. It may be said truthfully that he gave his life to the cause of charity. Mr. Preston was a member of the Executive and Administrative Committee) and was tireless in his labours to develop the movement in the United States, not only by active participation in the daily work of the A.R.C.H. departments but also by opportune personal contributions to the relief funds. His generosity was surpassed only by his modesty. In 1917, the American Red Cross arrived in Paris, and, among other matters, took over the CLEARING HOUSE. For such a vast administration far more office accommodation was requisite than the building in the Rue François I could provide. The Hôtel de Coislin, the old clubhouse of the Cercle de la Rue Royale, at the corner of that street and the Place de la Concorde, was to let. But the rental rather intimidated the Red Cross officers. Mr. Preston quietly settled the matter by taking the premises ; and placed them at the disposal of the Red Cross for the duration of the war. Only a few intimate friends knew of his initiative, and even they only because their connection with the administration of the Red Cross and the CLEARING HOUSE made them necessarily acquainted with the facts. The newspapers merely announced that "a generous anonymous donor, regarding whom nothing is known beyond the fact that he is a countryman of Mr. Wilson, has leased the de Coislin mansion and turned it over to the American Red Cross for its headquarters." Not until long afterwards was Mr. Preston's name mentioned publicly in relation with the gift. He was in very truth one of those who, in Dr. Woodrow Wilson's words, dedicated life, fortune, everything, to "support of the principles that gave America birth and the happiness and peace which America has treasured." In the course of this record reference has been made to the services rendered by other individual members. The list is by no means complete. Mr. John Keller Page for months gave all his time to the A.R.C.H. and the benefit of his business acumen and experience ; Mr. Persifor Frazer Gibson took charge of the work at the Rue Pierre Charron warehouse from its opening to the absorption of the CLEARING HOUSE by the American Red Cross ; Mrs. Claire C. Sisco, Honorary Comptroller, prepared the balance-sheets, a work involving the checking and analysis of scores of thousands of accounts and complicated international transactions ; the four statistical reports issued are the most conclusive evidence possible of Mrs. Sisco's mastery of the accountant's art --- or science --- and of her whole-hearted devotion to the work of the CLEARING HOUSE. Special reference is due also to Miss Marian Will, of the volunteer secretarial staff. She was the first to join the feminine forces of the CLEARING HOUSE when it was founded; she remained with it to the end and continued with the Red Cross after that great organization took over the relief work in France. The Minutes refer repeatedly to Miss Will, one of the mentions being a resolution passed unanimously by the Executive Committee to express "its high appreciation of the valuable services performed by Miss Marian Will whose industry and intelligence shown each day have been invaluable in overcoming the difficulties of her Department." Miss Rawle, Mrs. Sewell, Miss Colvin, Miss Chloe Owings, all of the volunteer secretarial staff, receive mention in the CLEARING HOUSE archives for their activity to develop the relief work. Similarly grateful references are made to Mr. P. Lorillard Ronalds ; to Sir Horace Pinching; to Mr. Frank B. Gibson, Accountant and Assistant Comptroller after the retirement of Mr. Scott ; to Mr. Charles A. Johnson, appointed to the same dual post when, on America's entry into the war, Mr. Gibson returned to the United States ; to Mr. John H. Jordain who took charge of transportation when, on June 8, 1917, Mr. Barbour resigned to become President of the Army and Navy Y.M.C.A. Mr. Barbour's resignation was a heavy blow to the A.R.C.H. The President, in conveying it to the Executive Committee, stated that he had done his best to induce Mr. Barbour to reconsider his decision, for "it was the unanimous opinion of the Executive Committee that Mr. Barbour's services had been invaluable and without him the CLEARING HOUSE would never have become what it had become." He expressed his "personal regret and sorrow, which reflected the opinions of his colleagues." Mr. Beatty, on behalf of the Administration Committee, expressed the same sentiments, and it was resolved unanimously to "put on record a vote of thanks to Mr. Barbour for the splendid work he had done for two years and a half, and its (the Committee's) appreciation of his unfailing courtesy, and to express regret that he feels himself obliged to take up other duties ". A few days later the Committees gave Mr. Barbour a silver tea-service as a tangible evidence of esteem and recognition of his work. The Executive Committee of the WAR RELIEF CLEARING HOUSE, New York, also testified its appreciation of the services rendered by Mr. Barbour in a resolution voted unanimously, June 28th, 1917. The Resolution states that " the members of the Executive Committee of THE WAR RELIEF CLEARING HOUSE FOR FRANCE AND HER ALLIES, both in their individual and official capacities, do hereby record their appreciation and gratitude to Mr. Barbour for his untiring interest and self-sacrificing labor in connection with the AMERICAN RELIEF CLEARING HOUSE, where he has most sympathetically and efficiently co-operated with. the WAR RELIEF CLEARING HOUSE FOR FRANCE AND HER ALLIES in the handling of its relief work, and extend their best wishes for him in his new field of endeavor." At the root of Mr. Barbour's resignation was the irresistible desire "to render the biggest service possible to the general Cause." He had accepted the Presidency of the Army and Navy Y.M.C.A. because, in that field, now America had entered the war, there was more work to be done, more even than with the A.R.C.H. In that detail --- the cheerful readiness to accept the heavier task --- is seen the A.R.C.H. spirit, the spirit of altruism. The sinews of relief were, indeed, as much spiritual as material.